Rangers have confirmed that striker Kyle Lafferty will not be available for selection for Sunday's Scottish Premiership match against Hamilton. Lafferty was an 87th-minute substitute for the Gers in their 3-1 win over Hearts at Ibrox on October 7 but he contacted Northern Ireland manager Michael O'Neill later that evening to inform he was pulling out of the international matches against Austria and Bosnia and Herzegovina due to an Achilles injury. FIFA's 'five-day' rule prevents players from representing their clubs for five days after an international break, if requested by the nation's governing body, and he will now miss the game at the Superseal Stadium, live on Sky Sports. 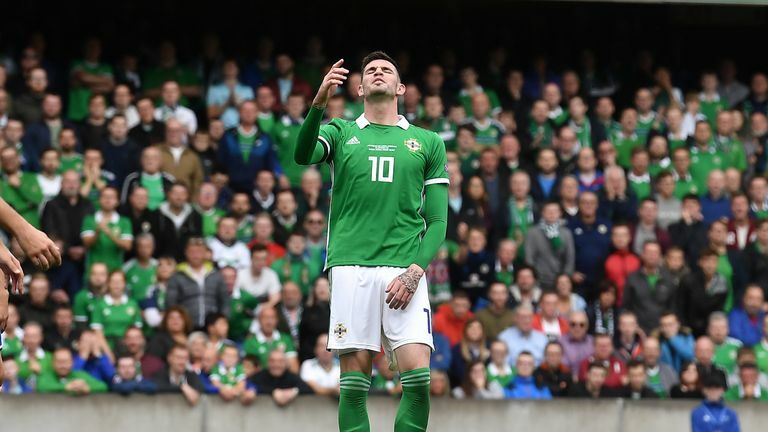 "Rangers can confirm Kyle Lafferty will not be available for the match against Hamilton on Sunday after the Irish FA invoked FIFA's five-day rule," read an official club statement. "Talks have now been held among all parties and Rangers understands the position of the Irish FA. "Kyle did not comply fully with international protocol but remains available for international selection." Lafferty has scored five goals in 16 appearances for Rangers in all competitions this season. Watch Hamilton v Rangers on Sunday. Coverage begins on Sky Sports Football at Sky Sports Main Event at 1pm.